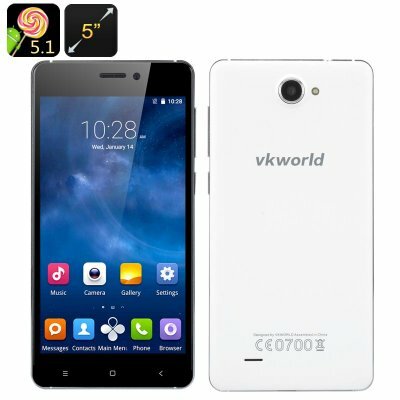 Successfully Added VKworld 700x Android 5.1 Smartphone - 5 Inch HD Gorilla Glass Screen, Quad Core CPU, Dual SIM, Smart Wake (White) to your Shopping Cart. The VKworld 700x is a powerful, featureful and affordable smartphone. With a nice 5 inch HD screen protected with Gorilla Glass, Android 5.1 interface and a quad core CPU with great multitasking capabilities. While most budget smartphones don’t come with great screens, the VKworld 700x is a pleasant exception. It features a 5 inch IPS screen with 1280x720 resolution, a 3.0D curve and is well protected against damage thanks to the use of Gorilla Glass. This means that all your media will have a great home and will be displayed in HD quality. You can save your files and apps on the 8GB of internal memory and that can be further expanded with 64GB on a micro SD card. Thanks to the support of Smart Wake, you will be able to get quick access to your favourite apps right from locked screen. With Android 5.1 interface, you have unlimited access to the Play Store to stock up on all the apps and tools you might need. The smartphone has good coverage: 2G (GSM 850/900/1800/1900/2100MHz) and 3G (WCDMA 850/2100MHz). With 2 SIM card slots, you’ll be able to efficiently separate your personal and work lives - and always stay in touch. You will also be able to make your smartphone a portable Wi-Fi function thanks to tethering support. The quad core processor is great for multitasking and playing around with various apps and tools. The phone comes with a 2200mAh battery and offers up to 150 minutes of uninterrupted talk time and 180 hours on standby. The VKworld 700x Smartphone comes with a 12 months warranty. Brought to you by the leader in electronic devices as well as wholesale Android Phones..